Check out our new PAPA Visual Art Award Winners plaque! PAPA Senior Grace Read (below) points out her 2018 New Mexico Art Education Association Scholastic Art Award. She won a Silver Medal in Comic Art. Congratulations! 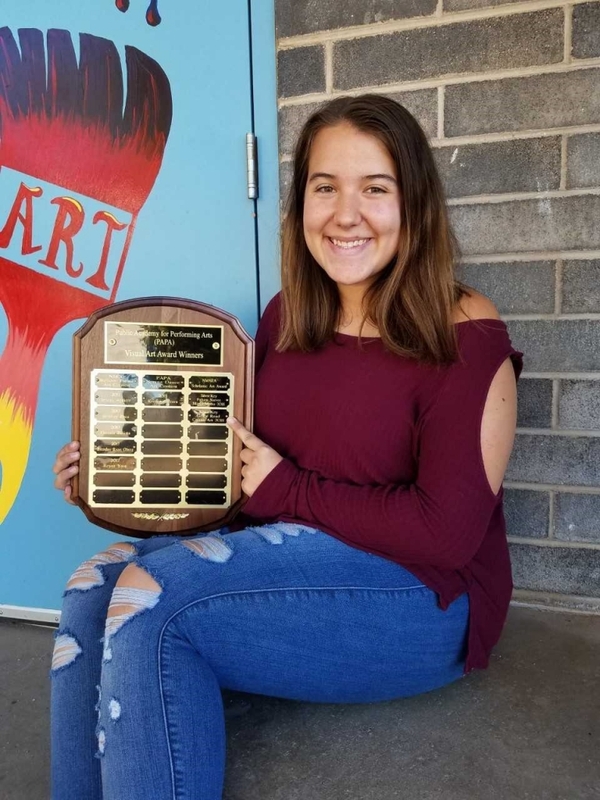 Also on the plaque: 2017 NHCC Balloon Fiesta Art Contest Winners Jenaya Aguirre, Daniela Basista, Brendan Ryan Oberg, Reyna Yara, along with past PAPA students and some alumni! Way to go, PAPA artists! Check it out in the PAPA display case soon! Special thanks to All Sports Trophies for the beautiful plaque!